In an earlier note I discussed why malicious LinkedIn activities seem less prevalent Facebook and Twitter ones. 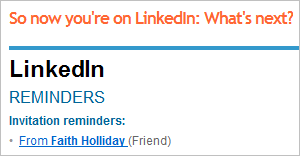 Yet, the users of LinkedIn aren’t immune to risks. The most prevalent form of scams and fraud associated with LinkedIn appears to be spam that mimics the look of LinkedIn emails. This isn’t surprising, considering that the service heavily relies on email to communicate with its user base—sending weekly social network updates, invitations to connect, group announcements, and so forth. Kimberly at StopMalvertising described an incident where an email message bearing the same subject directed the victim to a website hosting an exploit kit that attempted to infect the person’s PC with ZeuS. “It was great talking to you the other day. Good luck on all your projects….I’m sure they’ll turn out great. BTW…here’s the site I told you about that set me up with all the financial aid for my online masters. “Your LinkedIn account was blocked due to inactivity. 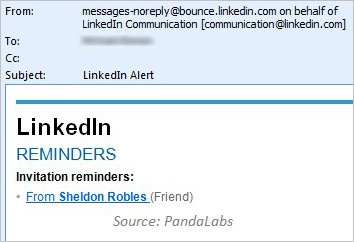 Users of LinkedIn are conditioned to receive LinkedIn emails and click on the embedded links. After all, they tend to visit linkedin.com less often than facebook.com, commonly relying on email messages to keep up with their LinkedIn network. As the result, LinkedIn-themed messages provide an effective pretext for distributing malicious links. Examples above show that such links have taken email recipients to websites hosting exploit kits, affiliate link trackers, and rogue pharma sites. I’m surprised that I haven’t encountered examples where LinkedIn look-alike spam phished users’ logon credentials. Have you?